On July 26, the South Korean government blocked two Korean-American activists from entering the country. Both activists planned to meet with their South Korean counterparts and to participate in a series of events, many of which are in response to the controversial decision to station a Terminal High Altitude Area Defense (THAAD) missile battery in South Korea. [Elich] Let’s start with a little background. Juyeon, I know you put an enormous amount of time and energy into organizing this trip. Would you tell us something about the peace tour? [Rhee] Briefly speaking, this peace tour was about bringing awareness to the U.S. public regarding what’s happening in Korea around U.S. bases and the U.S. military presence. The U.S. has played a big role in the division and the current state of war in the Korean peninsula. Accordingly, it only appeared to be right to bring a peace activist delegation from the U.S., such as members of Veterans for Peace (VFP), to Korea, where local people’s resistance against U.S. bases is increasing, and to build solidarity and connection with each other. This year, we are to explore and learn about people’s resistance against biological and chemical warfare programs such as the JUPITR [Joint U.S. Forces in Korea Portal and Integrated Threat Recognition] program at Osan Air Base in Pyeongtaek, the air and noise pollution issues at Kunsan Air Base, and the THAAD deployment issue. In addition, we are to participate in the annual Peace and Life March around Jeju Island against the new naval base, and in the annual International Peace Forum. The trip was planned about four months ago, when Seongju had not yet been named as the location for THAAD, so we were supposed to change the plan as we saw fit once we entered South Korea. Where we stand, budget cuts on education and job creation in the U.S. have become important issues, and the peace tour is designed to highlight and connect that the THAAD deployments and U.S. base expansions are not serving anybody in both countries, but endangers the security of these two countries by increasing military tension in East Asia. [Elich] Tell us what happened when you arrived at the Incheon airport. How did you learn that you wouldn’t be allowed to enter the country? What explanation was given? [Lee] At the immigration checkpoint, we were taken into a small investigation room. There, immigration officers told us a « central agency » had placed a block on our entry. We asked why we were being denied entry, and they said because the immigration office is lower on the totem pole than the « central agency » that had placed the block, they couldn’t verify the reason. We asked why we are deemed detrimental to Korea’s national interest or public safety. The officers were unresponsive to our question. We were told that we would have to board the next flight out to Hawaii (as that was the first stop on our return ticket) at 9:00 PM the next day. So we stayed in the transit area of Incheon International Airport for the next 28 hours. Because we knew that Veterans for Peace members Bruce Gagnon and Ken Jones were flying into Incheon at 9:00 PM the next day and we wanted to see them and make sure they safely entered the country, we spoke with a Korean Airlines ticket agent to see if we could take a later flight out of Incheon. We were told by the Korean Airlines ticket agent that the National Intelligence Service had blocked our entry and that there was an order for immediate deportation, so we could not extend our stay. [Elich] How was your experience while waiting for a return flight? [Rhee] While in the transfer area, I was mostly concerned about making changes to our trip plans, as I was the coordinator of the trip. I remembered that a Palestinian friend had once told me that every time she flies, she knows to expect harassment from border control agents and that Arabs are three times more likely to be stopped and harassed at airports than non-Arabs. I suddenly felt sad that this, unfortunately, is a routine experience for some people. But this experience of being denied entry has hardened our resolve to fight for democracy and peace even more. Many South Korean activists sent us text messages of encouragement and referred to our experience of state repression as a « rite of passage » as people fighting for justice in a time of increasingly authoritarian rule. [Elich] The application of provisions 11 and 12 of the Korean Immigration Law in your case is logically unsupportable. Your plans were entirely peaceful, and the events will proceed regardless. What do you think are the real reasons behind your deportation? [Lee and Rhee] We are of the opinion that it has to do with the current hot-button issue involving the THAAD missile defense system. 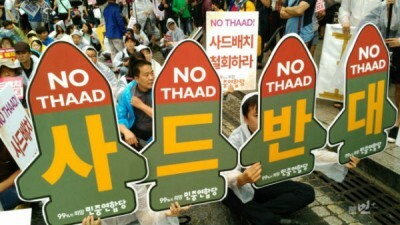 The South Korean government may want to block peace activists from internationalizing the struggle to oppose the recent U.S.-South Korean decision to deploy a THAAD battery in South Korea. Since a joint U.S.-South Korean working group announced Seongju, a small agricultural town in North Gyeongsang Province, as the designated site for THAAD deployment, Seongju residents have been on the street every day — protesting and holding candlelight vigils. The government continues to send representatives to Seongju to quell the protests and offer to « negotiate » but keep getting chased out by the residents, who refuse to accept anything less than a reversal of the THAAD deployment decision. Ninety percent of Seongju residents had voted for Park Geun-hye in the last presidential election, but they held a mock funeral procession for the governing Saenuri Party and have begun to leave the party in droves. An important objective of our peace tour was to build solidarity with the peace movement in South Korea in opposition to the THAAD decision. Ultimately the decision to deploy the THAAD system in South Korea was a U.S. decision — as part of its broader effort to encircle China and Russia with a network of missile defense systems and to protect its military assets in the region from North Korean missiles. We feel it is important for us, as U.S. citizens, to learn as much as we can from those who are fighting on the front lines of this issue in South Korea and return home to educate the U.S. public about what our government is doing abroad in our name and with our tax dollars. And we believe it is precisely this type of solidarity-building that the Park Geun-hye government wants to prevent. A strong connection and solidarity between the peace movements in the U.S. and Korea can really empower both sides on this issue. The Korean government must fear that our presence and voice of solidarity will embolden the South Korean people’s resistance against THAAD deployment. [Elich] What does your deportation say about the state of democracy in South Korea under the Park Geun-hye government? [Lee] Our deportation is not unique; it is the latest in a long list of progressive activists being denied entry into South Korea. In May of this year, a German citizen of Korean descent was refused entry after trying to attend a conference to commemorate the anniversary of the democracy uprising in Gwangju, a city that was the site of a bloody crackdown against democracy activists during the dictatorship of the 1980s. In 2012, Veterans for Peace members, who arrived in Jeju Island to join protests against the construction of the naval base there, were also denied entry. Since establishing an office in South Korea in June 2011, four Greenpeace East Asia staff have been denied entry without justification. Democracy has been under attack under the rule of Park Geun-hye, the daughter of former dictator Park Chung-hee. Since taking office in 2012, Park has waged an aggressive campaign of crackdowns against opposition leaders, labor unions, and all those who are critical of her policies. She jailed opposition lawmaker Lee Seok-ki in 2013 and dissolved the opposition Unified Progressive Party the following year. In 2015, she jailed the president of the Korean Confederation of Trade Unions, Han Sang-gyun for leading protests against labor market reforms and her neo-authoritarian rule. Recently, she shut down the investigation of the 2014 Sewol Tragedy despite protests from bereaved parents who lost their children in the tragedy. Today, her government is implementing by force the agreement reached with the Japanese government last December to absolve Japan of legal responsibility for its sexual crimes during WWII in exchange for a lump-sum monetary donation. The list of Park’s undemocratic policies and actions is long. [Elich] What effect does this experience have on your spirit and motivation? [Lee] It was an opportunity to reaffirm the strength of our community. Despite the unexpected setback, Veteran for Peace members with whom we had planned to meet up with in South Korea are able to continue the peace tour without us, because friends and organizations in South Korea are able to step in on a moment’s notice and fill in the gap — answering our last minute requests for translation and logistics coordination for the VFP members. We were turned around and stranded in Hawaii, but a community of activists immediately took us in and housed us, fed us and introduced us to the struggles of native Hawaiians. And friends back home from all over the United States sent us messages of encouragement. We feel blessed to be part of a broader community of progressive people — our greatest source of strength that enables us to face adversity without fear or hesitation. The experience also emboldened us to redouble our efforts in building solidarity with those fighting for democracy and peace in South Korea. As soon as we return home, we will immediately begin organizing U.S. opposition against THAAD deployment. Hyun Lee is a New York City-based writer and activist. She is a Korea Policy Institute fellow and a member of Nodutdol for Korean Community Development. Juyeon Rhee is a first generation Korean immigrant grassroots organizer whose work is focused on de-militarization, peace, and unification in Korea. Juyeon has been a member of Nodutdol for Korean Community Development since 2000 and a board member at Korea Policy Institute. All three are members of the Solidarity Committee for Democracy and Peace in Korea.